Alleviating side effects of chemotherapy, protects bone marrow inhibition induced by chemotherapeutic agents, activates lymphoblast cells, enhances the cellular immunity function, increases resistance to diseases such as hepatitis, liver cirrhosis, and protects high-risk patients. 9405 has the outstanding non-invasive & antimetastasic effect against malignant tumors. It also has an excellent protective effect on bone marrow inhibition induced by chemotherapeutic agents. 9405 can improve the body’s defenses against blood serum gusers GPT and GOT, normalizing the liver function. 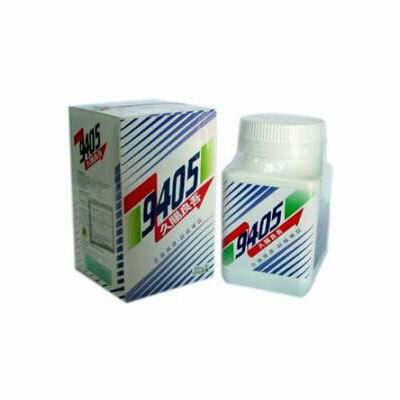 And it is clarified that 9405 has helped greatly the dialyzed patients who has hepatitis or chronic hepatitis. According to the studies and clinical experiences, the results of the serious illness, especially the cancers, renal diseases, hepatitis, will be better if the patients take the combined therapy of Western Medicine and Chinese Medicine early. No sugar, salt, yeast, corn, wheat, soy or milk added. No preservatives, no artificial colors, no flavorings. Adults, take 2 to 2.5 grams, 3 times a day. Spoon included.